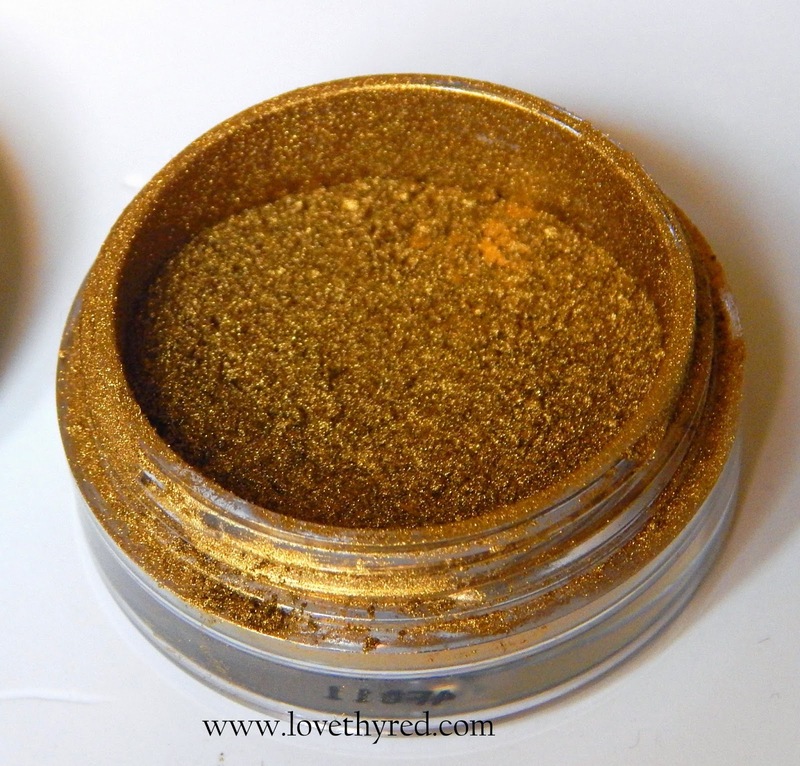 The Makeup Geek Loose Pigment LIQUID GOLD comes in a small plastic jar with a screw top lid. 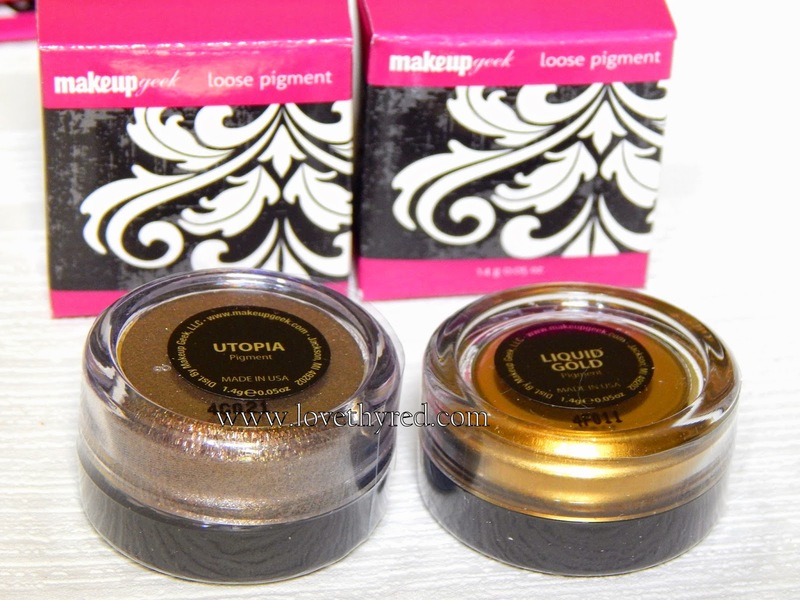 There is some inconsistency in packaging because out of the two pigments that I ordered, Liquid Gold was the one one which had no sifter (UTOPIA had a sifter)! and the jar was filled up to the rim, so there was a lot of spillage as soon as I opened the lid. 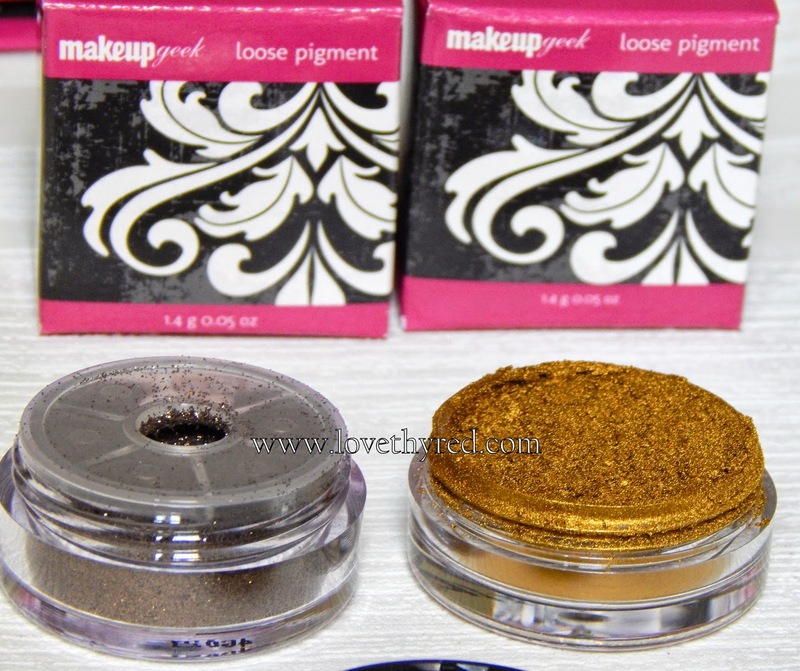 Without a sifter, it is really hard to manage a pigment and they get on your hands and kind of smear everywhere . It is very inconvenient to use or travel with. The shade LIQUID GOLD is a beautiful shade of Gold with some green accents which are more prominent when you use the pigment dry. When you use a damp brush to apply the pigment or try foiling the eyeshadow, the shade is a beautiful metallic gold!! LIQUID GOLD is a great shade for the lids, because of its versatility. You can apply it dry for a soft wash of Gold on the lids or you can apply it wet and create a lot of drama on your lids. It is intensely pigmented so good control is required when using the product. Tapping off the excess product from your brush goes without saying or else you might end up with some fall out that can ruin your base makeup. The texture is super smooth and the pigment is super fine so there is no glittery chunkines, just pure metallic color. LIQUID GOLD stayed on my lids for more than 7 hours. There was no fading or creasing but there was a bit of transfer with time, from the lids to the crease. The performance is slightly better when the pigment is applied wet. Overall, LIQUID GOLD is a great pigment to own if you’re fond of dramatic eye makeup. Ignoring the packaging, I have no other complaints with the product. It applies beautifully, wears for long hours and has the most gorgeous metallic finish I have ever seen in an eyeshadow, and all of that at a great price!! A must have in my opinion. Gorgeous shade..it's so intense. Loved your eye look!